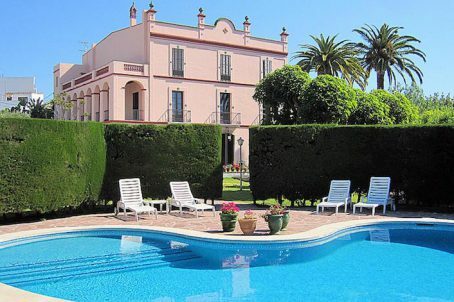 A 150 year old and fully renovated masia ( mansion ), inspired from Latin America with archades giving the house freshness during hot summer days. This lovely property is located only 40 km from the centre of Barcelona and only 2 km from the sea. The property consists of 2611m2 of land in the middle of the town albeit fully secluded and with complete privacy. There are three buildings constructed, a main building built in 1861 with about 600m2 of internal space, another building, which has been totally refurbished in 2011, consisting of around 500m2 of internal space and a third building of around 50m2 of internal space. The architect has made a pre-project of turning the main building into a hotel. And the town will issue a licence. Currently there are seven double bedrooms. Three of the bedrooms have en suite private bathrooms, two bedrooms share one bathroom and two further bedrooms share one further bathroom. There is a fully equipped large kitchen with all possible high quality equipment. Also a spectacular dining room that easily seats 14 people, a cosy salon, a TV room + a billiard room. The house is WIFI equipped. ** More pictures on request.